Croutons: Smash garlic clove and add to olive oil and let sit for 1 hour. Cut bread into 1/2-3/4 inch pieces. Sprinkle with garlic oil. Salt bread cubes and roast at 350 F for 10 minutes. Watch closely! Salad Dressing: Add all ingredients except olive oil in a small mixing bowl. Whisk to blend. Then, drain some of the oil from the anchovies into the olive oil. Whisk in olive oil/anchovy oil mixture until emulsified. Salad: Wash romaine leaves and spin dry. Break into bite size pieces and wrap in a tea towel. Place in refrigerator to crisp until ready to make salad. Cut bacon into 1/4 inch pieces. Cook bacon until crisp and drain on paper towels. Set aside until ready to make salad. Poach eggs in simmering water. Set aside until ready to make salad. Make Parmesan Curls using a mandolin. Place romaine leaves in a large salad bowl and toss with dressing. Add bacon, grated Parmesan cheese, and croutons. Distribute among four plates. 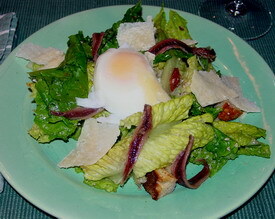 Place one poached egg on top of each salad. Decorate with five anchovy fillets on each salad. Sprinkle with Parmesan Curls. Serve. ©2009 Patty's Pinot Closet. All Rights Reserved.